This week’s Speedy Tuesday pick is a Moonwatch with a Moon complication of one of our Italian fans. It all started in 1987 when Omega decided to put a moonphase Speedmaster on the market. In the end, they started up introducing three different Speedmaster models with a Moonphase: Two ‘teutonic’ models (1986) and one Speedmaster Professional ‘Moonwatch’ (1985) version with a moonphase complication. All three had the famous caliber 861 as a base movement and a moonphase module added to it, also known as the caliber 866 movement. As you can see, a beautiful composition of stainless steel, a silver dial and an 18 carat white gold bezel. 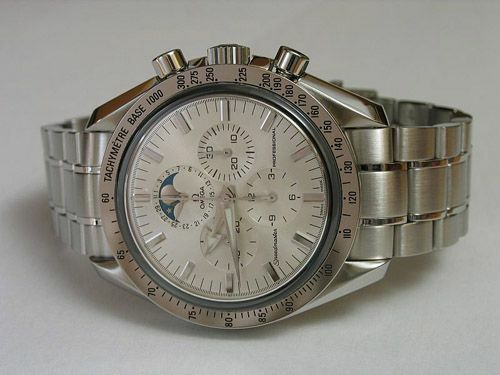 Later on, in the 1999, Omega introduced the Moonphase for their Speedmaster Professional collection again. 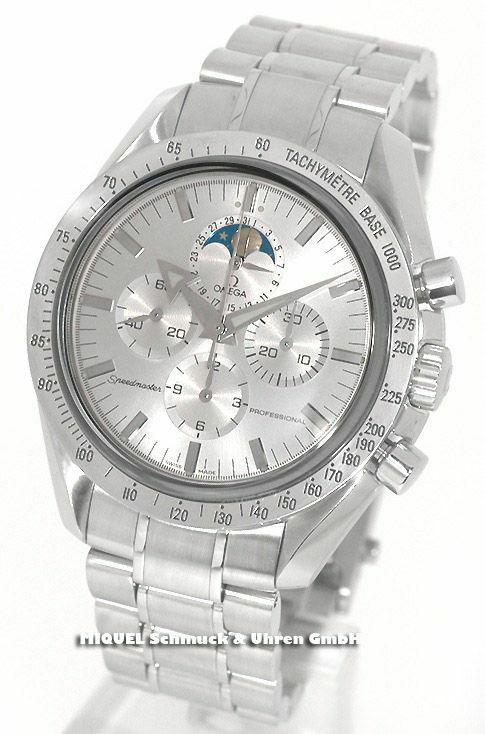 A white gold Speedmaster Professional with a moonphase disc (we covered it here) and a few years later, in 2003, a ‘regular’ Speedmaster Professional with a moonphase disc, very similar to the model of the 1985 (1300 pieces only) and an Omega Speedmaster Professional Broad Arrow Moonphase model, based on the 1957 re-edition Speedmaster that Omega introduced in 1997. Not to be confused with the Broad Arrow Speedmaster that Omega produced later on, with the F.Piguet based caliber 33xx movement that caused so much fuzz. These Speedmaster Professional Broad Arrow Moonphase models came in two flavours, one with blued hands and a cream colored dial and this week’s pick: a silver dial with silver colored hands. Not a perfectly legible as the ‘Moonwatch’, but very beautiful. We found this larger picture from watch dealer Miquel in Germany, who has it for sale (for 3699 EUR). We do not have exact number on these Speedmaster Professional Broad Arrow Moonphase watches, but they have been made in a limited production run somewhere in the early 2000s. First introduced in BaselWorld in 2000 and not in the official catalogs after 2003. Inside, an evolved version of the 1980s caliber 866 has been used, the caliber 1866. It is basically the same movement, with a few slight modifications that these Lemania based calibers got along the way. More information on these models can be found on this page by Chuck Maddox. Funny thing is, that although these models are part of the ‘Professional’ collection, they also bear the “The First Watch Worn On The Moon” caseback. This doesn’t make much sense, but we can live with it I guess. The only Speedmaster Professional with a Moonphase is the black dialed model that comes close to the original Speedmaster Professional ‘Moonwatch’. You wil only find the Speedmaster Professional Broad Arrow Moonphase watches in the pre-owned market or, with some luck, as New Old Stock watches somewhere.